The School Galleries | Launceston Then! Launceston Grammar School in 1871. Rev. Samuel Childs Clarke. The other masters were Mr. Priest on the left and Mr. Bosworthick on the right. 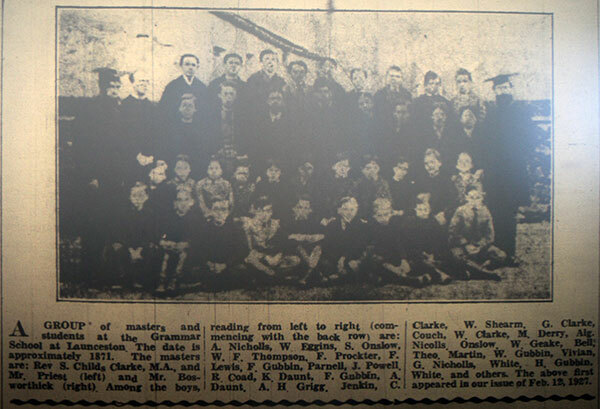 Among the boys from the left commencing from the back row were: A. Nicholls, W. Eggins, S. Onslow, William Fookes Thompson (who would later become a Doctor and Mayor of the town), F. Prockter, F. Lewis, F. Gubbin, Parnell, J. Powell, R. Coad, K. Daunt, F. Gubbin, A. Daunt, A. H. Grigg, Jenkin, c. Clarke, W. Shearm, G. Clarke, Couch, W. Clarke, M. Derry, Alg. Nicolls, Onslow, W. Geake, Bell, Theo. Martin, W. Gubbin, Vivian, G. Nicholls, White, H. Gubbin, White and others. Images of the School’s of Launceston and its district. National V.P. School including St. Catherines C.E. School. South Petherwin County Primary School. St. Stephens County Primary School.